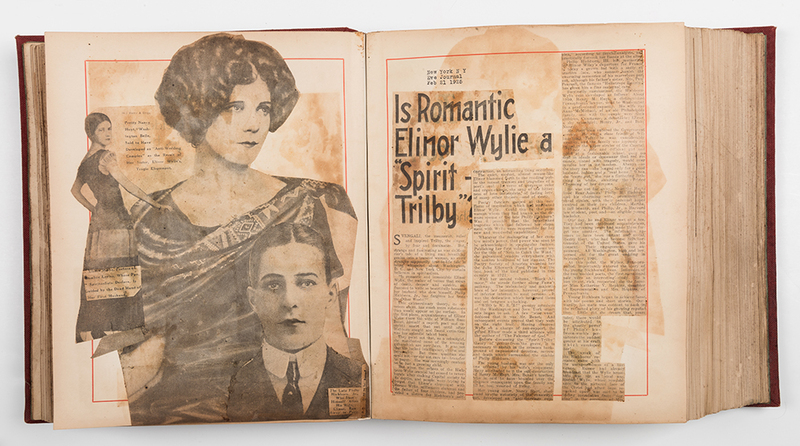 Lot Detail - A Two Volume Spiritualism Scrapbook Kept and Annotated by Harry Houdini. 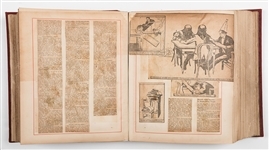 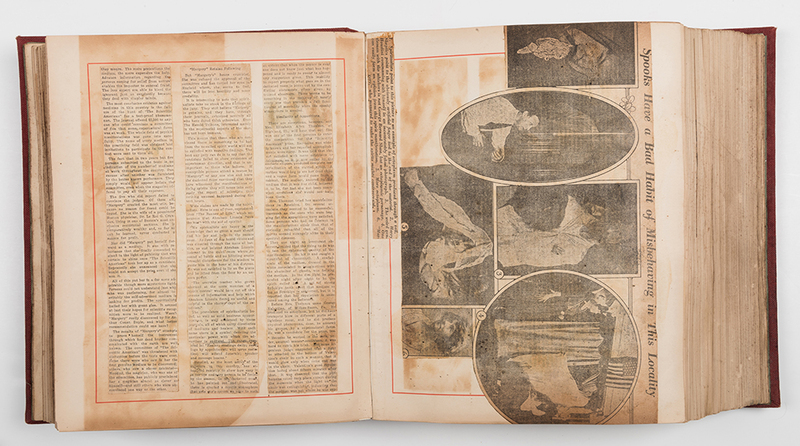 A Two Volume Spiritualism Scrapbook Kept and Annotated by Harry Houdini. 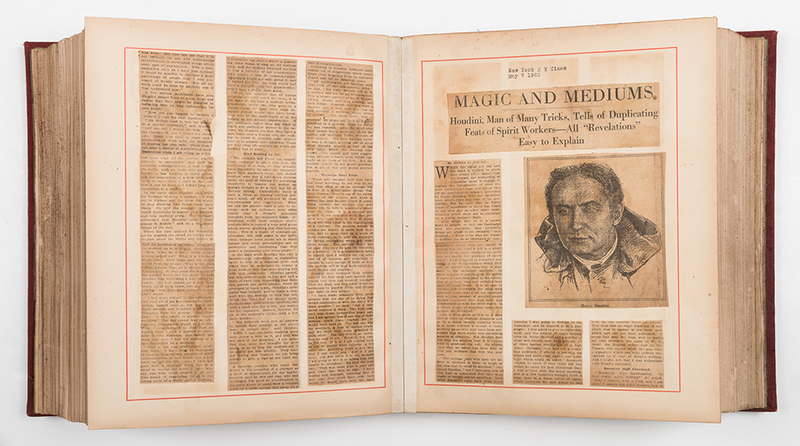 Houdini, Harry (Ehrich Weisz). 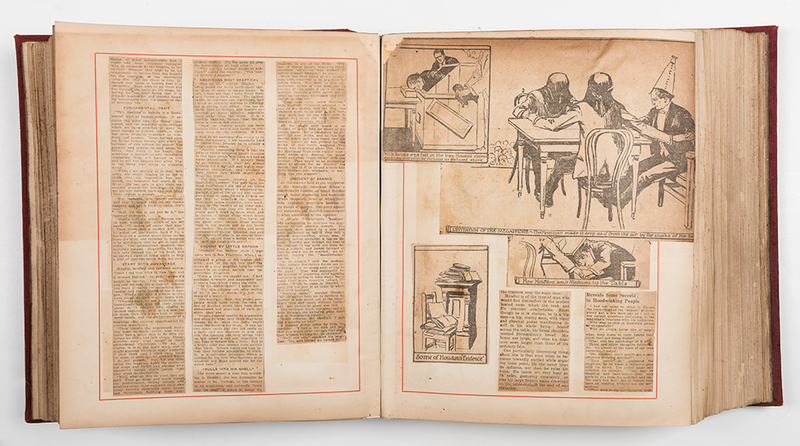 A Two Volume Spiritualism Scrapbook Kept and Annotated by Harry Houdini. 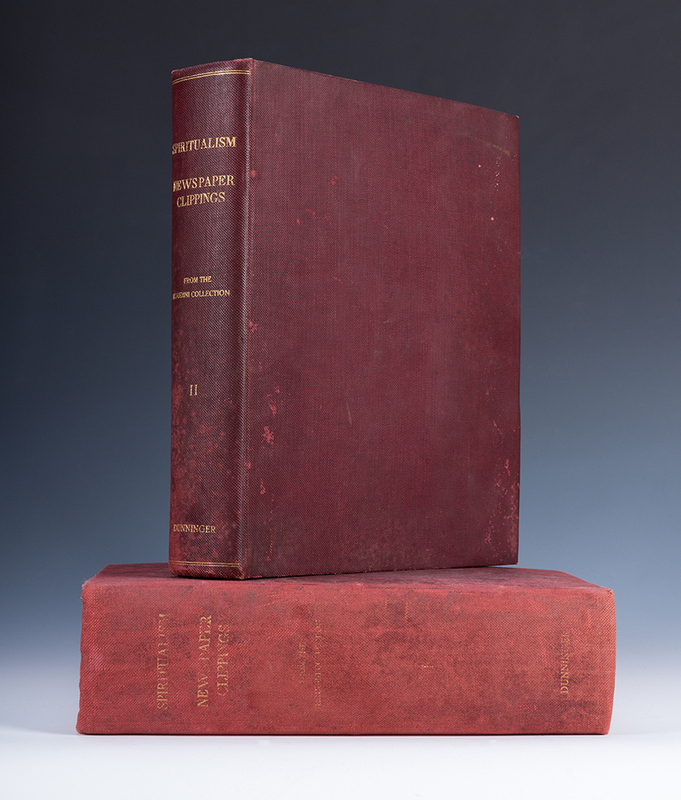 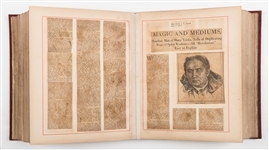 Two quarto volumes (12 x 10”), approximately 200 and 140 leaves respectively, obtained from Houdini’s collection by the magician-mentalist Joseph Dunninger, and bound by the latter in maroon cloth, spines lettered in gilt. 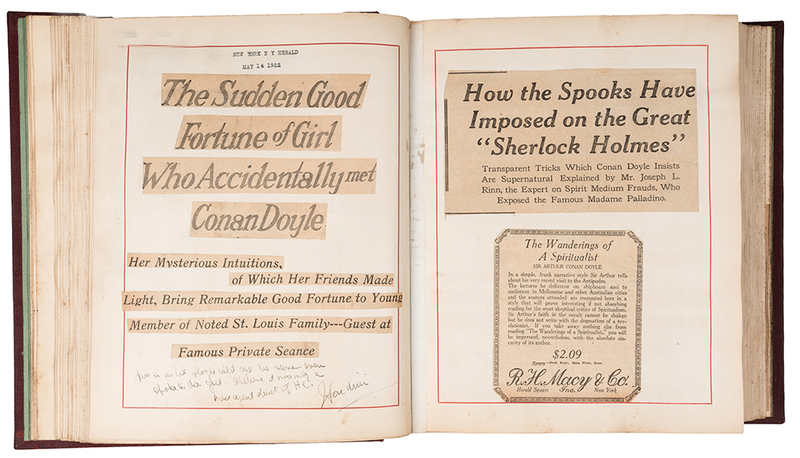 Principally spanning 1922—25, with some supplemental clippings added by Dunninger as late as 1930, the earliest about 1892. 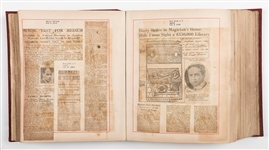 Comprised of hundreds of newspaper and news-magazine clippings pertaining to spiritualism and related subjects, the second volume (bulk 1922) almost entirely devoted to coverage of Sir Arthur Conan Doyle’s belief in spiritualism and the supernatural, and signed “Houdini” three times, with scattered annotations, including below a headline from the New York Herald on the “mysterious intuitions” of which a young St. Louis girl appeared capable: “This is a lie Doyle told me he never even spoke to the girl. 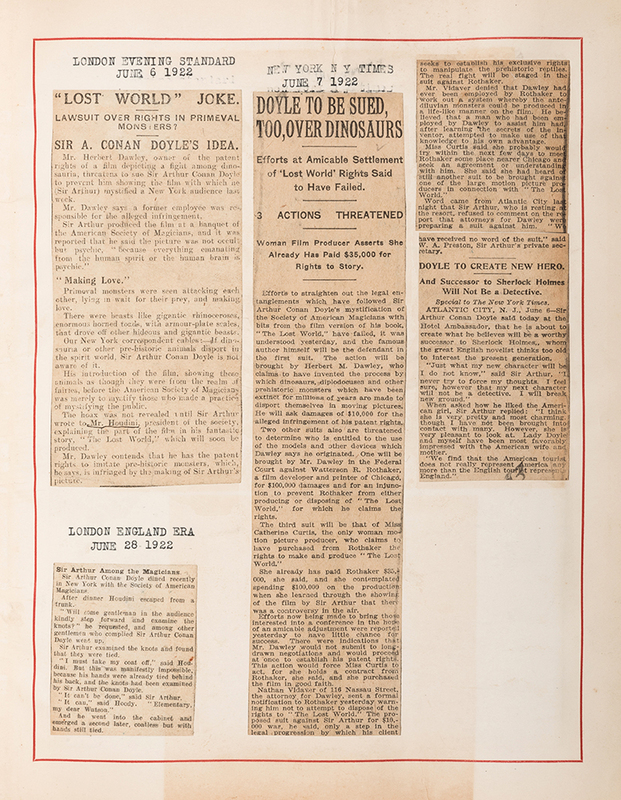 I believe it was only a press agent stunt of HC./Houdini”. 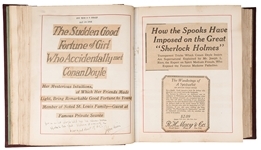 The first volume (bulk 1924—25) focusing on exposures of the methods of fake mediums and spiritualists, including coverage of Houdini’s own public challenges made to mediums, including Margery (Mina Crandon), and containing at least a dozen annotations in Houdini’s hand, with several clippings regarding police raids of “spook parlors” in San Francisco supplied to Houdini and annotated by Samuel “Shadow” Baldwin. 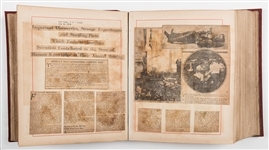 Clippings mainly from major American and English newspapers (New York, London, Boston, Chicago, San Francisco, Denver, and elsewhere), but also representing papers of other American and English locales, as well as Scotland, Germany, and Brazil. 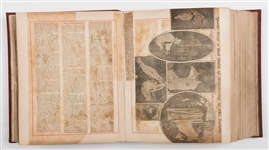 Most pieces securely affixed to pages, a small proportion flaked off and laid in on the appropriate page. 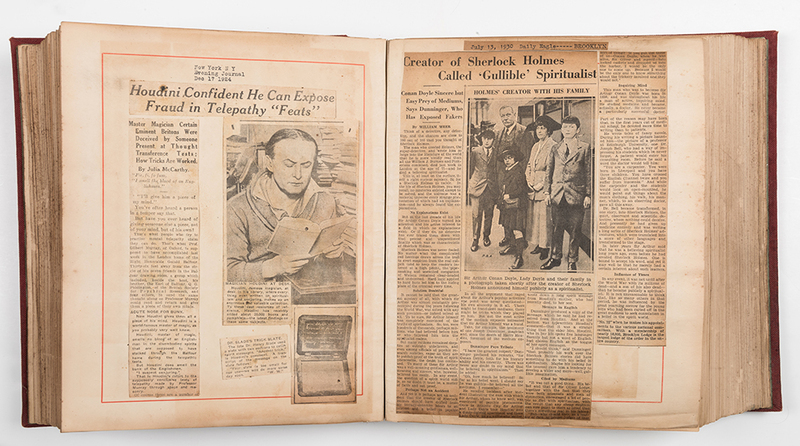 These scrapbooks offer fascinating personal insights into the project of “spirit debunking” to which Houdini turned in the final chapter of his life and career. 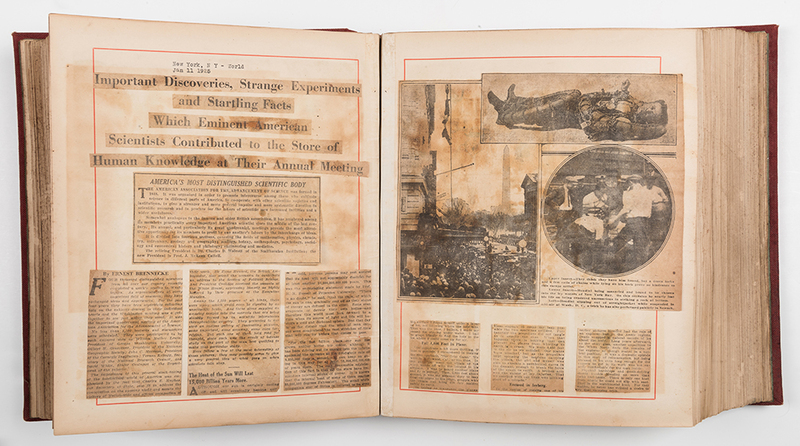 Central to its pages are the figures and cases which captured Houdini’s attention at the height of public interest in the topic, including Margery and Arthur Conan Doyle, both of whom were primary subjects of inquiry for Houdini and his followers. 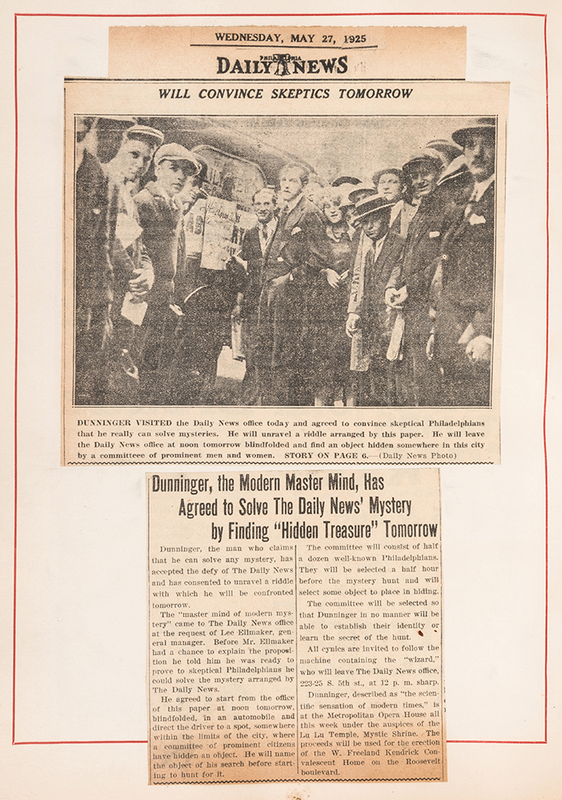 Dunninger, a prominent magician and friend of Houdini’s, was one of the leading torch-bearers into psychic investigation in the decade following Houdini’s death, publishing the expose “Inside the Medium’s Cabinet” in 1935. 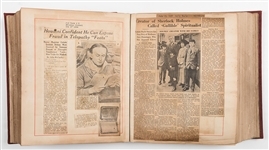 He inherited the scrapbooks among the troves of Houdini’s records and relics acquired after his death in 1926, and have remained in his Dunninger’s family’s possession ever since. 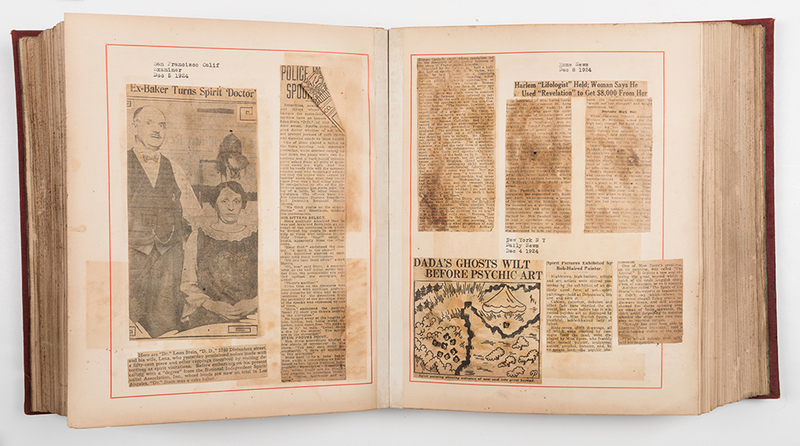 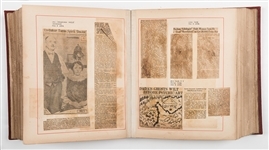 Adding a fascinating layer of context to the project of “spirit debunking” that dominated Houdini’s performance and publishing career in the last period of his life, these scrapbooks extensively record the fever pitch that the “duel” between magicians and mediums reached in the 1920s. 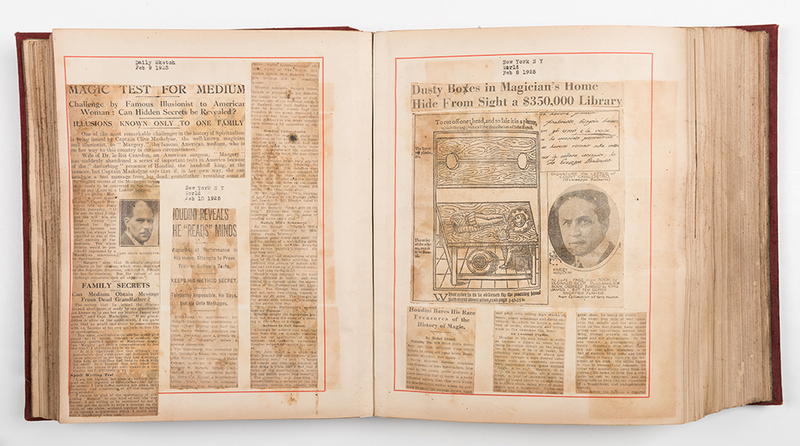 Alongside Houdini, Dunninger was one of the leading spirit debunkers of the 1920s. 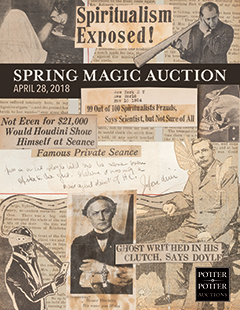 Auction closed on Saturday, April 28, 2018.